Including the post formats in your WordPress theme allows you to designate a different content display and styling for certain types of designated posts. Unlike custom post types, you can’t create different post formats, because WordPress has already assigned them for you; you decide which post format, if any, to use in your theme. You can, however, use one or all of them, depending on your needs. Standard: Displays your blog posts in the default manner — as an ordinary blog post without special formats applied to it. Aside: A short post (but not a full post) to share a random thought or idea. Typically, an Aside is shared without a post title or category/tag designations. An Aside is simply a random, one-off thought shared on your blog. Chat: A transcript of an online chat conversation that can be formatted to look just like a chat (or instant messaging) window. Gallery: A gallery of images in which each image can be clicked to access a larger version. Often, these post formats contain no text and display only a gallery (but they may have a title). Image: Used for displaying one image, such as in a photo blog. The image may or may not have text or a caption to go along with the post. Link: Displays a short post that provides a link that you find useful and want to share with your readers. This post format often contains a title and sometimes a short bit of text that describes the link you’re sharing. 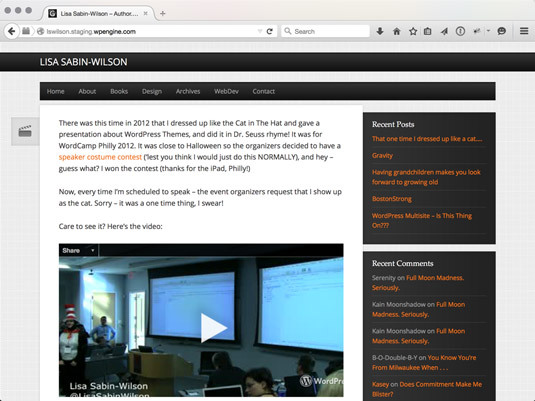 Quote: Displays a quotation on your blog. Often, users include the quotation along with a byline for its source. Status: Provides a short status update, usually limited to 140 characters or fewer (think Twitter!). Video: Displays a video, usually embedded within a handy video player (à la YouTube) so that your readers can simply click to play the video without leaving your site. Audio: The post format for sharing audio files, or podcasts. Usually, an Audio post has very little text included and instead includes items such as a built-in audio player that visitors can click to listen to audio files. Video post formats in use. If your site needs a different type of a post format that isn’t available, consider adding it as a custom post type instead.